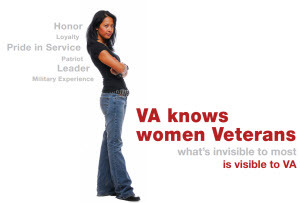 Hines VA is committed to meeting the unique needs of Women Veterans by delivering the highest quality comprehensive health care to each woman, while offering her privacy, dignity and sensitivity to gender-specific needs. The Medical Director for the Women's Veterans Program and the Women Veterans Program Manager (WVPM) oversees the quality of the health care you are provided and are ready to assist you in getting timely access to your health care. Women’s health care is also provided at our Community Based Outpatient Clinics in Aurora, Hoffman Estates, LaSalle, Kankakee, Oak Lawn and Joliet. Each Veteran is unique. Call 1-800-827-1000 or 708-202-8838, for help determining your individual eligibility status. Illinois Department of Veterans Affairs and the YWCA of Metropolitan Chicago and VA have partnered to connect Illinois Veterans to quality child care at no cost while attending scheduled medical and counseling appointments, as well as job interviews. The program, called Tiny Boots, is funded through a grant from the IDVA Vet Cash Grant Program that is part of the Illinois Lottery. The Vet Cash ticket launched in 2006 as the first lottery game in the country to designate 100-percent of net proceeds to Veterans. Veterans can contact the YWCA at 630-580-3199 or via email at wecareforourvets@ywcachicago.org and apply at www.ywcachicago.org. Urogynecology – a complete range of treatment options for women with urinary incontinence (leakage), bowel incontinence, pelvic organ prolapse and fistula. We offer pelvic physical therapy, nonsurgical options, and also minimally invasive surgical approaches including robotic-assisted surgery and vaginal surgery. Gynecology services including major and minor surgeries provided onsite. robotic-assisted minimally invasive laparoscopic surgery. sterilization by tubal ligation or Essure® procedure. colposcopy (investigation of abnormal pap smears). cone (LEEP) procedures (treatment of cervical abnormalities). endometrial ablation (treatment of abnormal bleeding). evaluation of chronic pelvic pain. a full range of reproductive health options (including IUDs, birth control pills, NuvaRing®,Implanon®, sterilization). menopausal care including hormone replacement therapy. Homeless program triage services: linking at-risk and homeless women veterans to resources in the community and within the Hines Healthcare for Homeless Veterans Program.